The HP Pro 8600 all-in-one printer is great for personal use. Staples currently has the best price out of reputable stores for the printer itself at $99 shipped. This is a 4 in 1 printer that copy, scan, fax and print. Printing speed is impressive at eighteen pages per minute for black and thirteen pages per minute for color. Wireless B/G/N capabilities allow for easy compatibility with mobile devices, laptops and desktops. An Ethernet port is also available for those who prefer to hard wire devices on their network. The paper tray can hold up to two hundred and fifty pages. There is a maximum monthly duty cycle of 25,000 pages. All signs and most reviews point to the fact that this is a solid printer at a fair price. 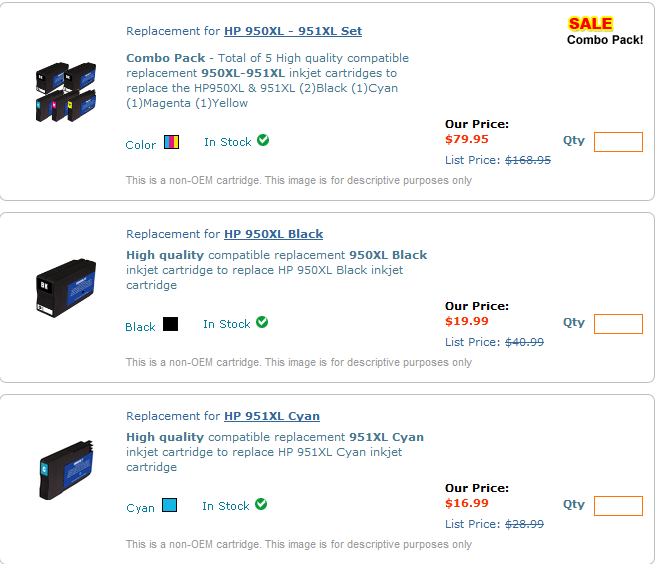 Black – HP 950 Cartridges – costs $25 on Amazon for the official HP brand. 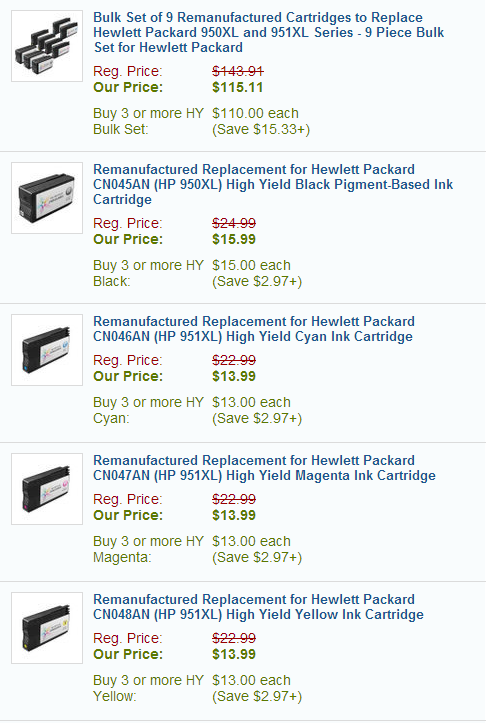 Color (Cyan, Magenta, Yellow) – HP 951 Cartridges – costs $48 on Amazon for the official HP brand. It’s important to note that by combo they mean you actually receive 3 different color ink cartridges. The price for a single color of HP 951 is in the $17 to $20 range on Amazon. If you burn through a lot of ink, you can also buy the HP 951XL and HP 950XL cartridges to print more than twice as much without replacing cartridges. HP 950XL with 2x the ink costs $39 on Amazon. Note this is about $11 cheaper than using 2 regular 950 cartridges at $25 a piece. HP 951XL combo with all three colors is about $74 on Amazon. This is a pretty good savings giving that 2x the 951 cartridges would cost $96, so the XL version saves about $22 if you use a lot of ink. Now that we have established the base line prices of genuine HP ink, we’ll looking into the savings of buying re-manufactured ink. 123inkjets is currently my favorite source for cheap ink. I wrote a review of their service here. 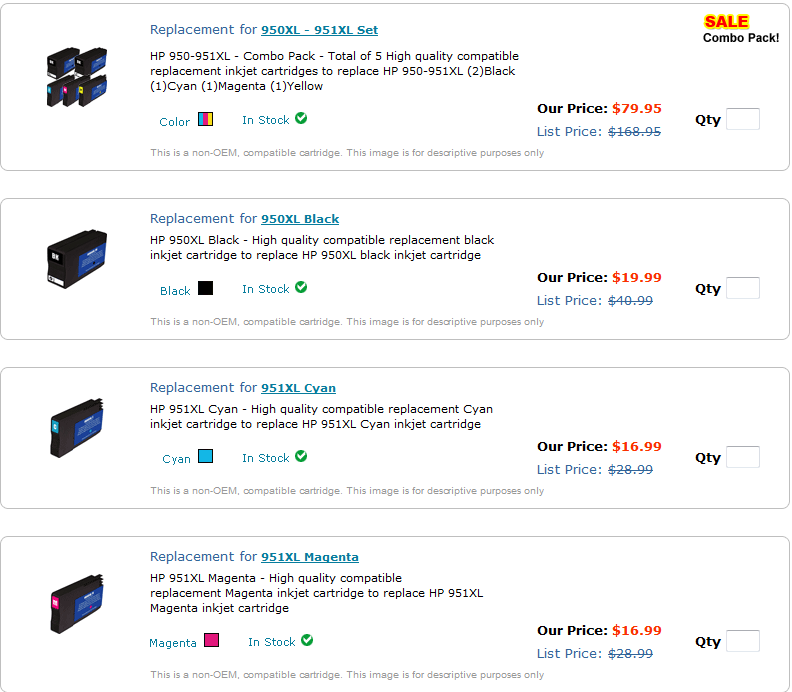 123inkjets re-manufactured price comparison for the HP 8600 Pro printer. Note 123inkjets only deals in the XL versions of the cartridge with over twice as much ink as the standard sizes without the letters XL at the end. As you can see the re-manufactured ink costs roughly half as much in both cases. 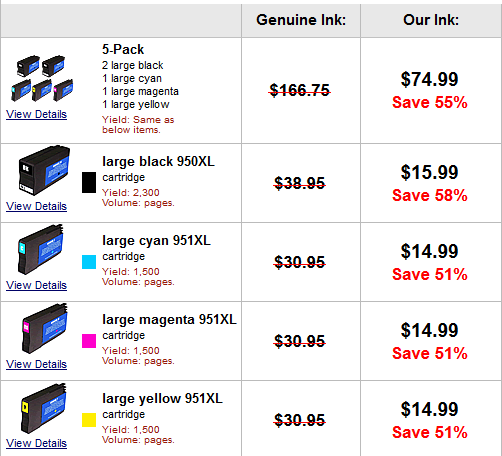 123inkjets also ffers a mega pack with 3 black 950xL and 6 951XL (2 of each color) for only $115. 123 is also offering another $15 off all ink orders with coupon code SCUBA. Shipping is free at 123 for all orders over $55. 101inks.com has good prices, but 123inkjets is still a few bucks cheaper per cartridge. Even the sale price of $80 for 2 black 950XL and the combo of all the 951X works out to be a little higher at around $16 per cartridge. This difference isn’t significant though. Inkfarm.com is also a couple bucks more per cartridge. 1ink.com was the highest I checked for this series of HP ink. The prices are still damn good compared to the genuine cartridges and the store has a fine reputation though.